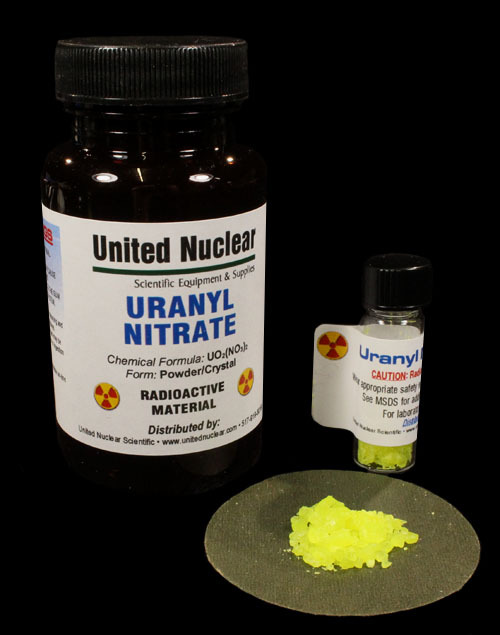 Uranyl Nitrate is a radioactive, water soluble Uranium compound. It is quite fluorescent and glows brightly under UV light. It is mildly radioactive emitting primarily beta and gamma radiation. One of the earlist uses for the material was in developing photographs. Prints produced using Uranyl Nitrate are known as 'Uranium Prints', or more commonly, 'Uranotypes' Like most heavy metals, Uranyl Nitrate is chemically toxic. Inhalation of any dust particles can be hazardous. Ideal for collectors of those experimenting with Uranium compounds. Comes as shown above, small vial packed in standard chemical bottle. Available in a 1 gram or 10 gram quantity - select size below. Caution: Use normal laboratory safety precautions when working with Uranyl Nitrate. Inhalation or ingestion of the dust particles may be harmful. Note: adult signature required upon delivery.